Tanzanian Model and video vixen Hamissa Mobetto has shared the first photo of her son in an Instagram page created for the infant. Hamissa refers to her new born son, whom she delivered on Tuesday, as Baby Dee, Tanzanian Baby. 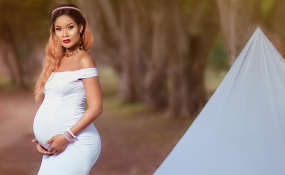 The Salome Video Vixen was first rumored to be pregnant early this year with word going round that Bongo hit maker Diamond Platinumz could be the father of the child.